Def Leppard (1977-present) is a NWOBHM band from Sheffield, UK. ef Leppard hit the lights in 1977 with Pete Willis (guitar), Rick Savage (bass), Steve Clark (guitar) and Tony Kenning (drums) at the helm. All students at Tapton School in Sheffield, South Yorkshire, UK, they were originally called Atomic Mass and took the present name when Joe Elliot joined on vocals. Their first gig was at an elementary school in front of 150 children and, shortly after a few more gigs, their drummer was replaced by Frank Noon. Elliott gave the band their name, originally spelled "Deaf Leopard", a band name he thought up while writing reviews for imaginary rock bands in English class (and a partial reference to Led Zeppelin). At Kenning's request, the spelling was modified to make the name seem less like the name of a punk band. In 1979 their debut EP, on their own 'Bludgeon Riffola Records', was released titled The Def Leppard E.P. in 1978; but once again they had drummer problems when Frank Noon returned to his former outfit and was replaced by Rick Allen. After they moved to London, gained the interest and offered a deal by 'Vertigo Records', and the debut On Through The Night resulted in 1980. Although the album hit the Top 15 in the UK, many of the fans of the day were turned off by the perception that the band was "selling out" to American audiences too much with tracks like Hello America and their debut tour headline tour including a trip to America supporting Pat Travers, AC/DC, and Ted Nugent). High And Dry (1981), although competent, received little notice. In 1983 Pyromania was released and proved to be their most successful venture to date supported by tracks like Photograph, Rock of Ages and Foolin'. During that year it was the second biggest selling album - second only to Michael Jackson's Thriller. Unfortunately Def Lappard were unable to take advantage and duplicate this feat. The album was legendary for its use of technology and studio effects that would revolutionize heavy metal in the 1980s. Trouble started, however, when Pete Willis was given the push after he showed up drunk for meetings; he was replaced with Phil Collen. They also received flak from die-hard fans that noticed their drifting from their NWOBHM roots into a more Pop-Metal style, a style that would dominate their music for the rest of their career. But their luck didn't change by New Year's 1984, when Rick Allen was in a car accident which caused him to loose his left arm. For most drummers this would spell the end of a career, but not in Def Leppard. The band kept their faith and Allen rehabilitated and learned to use his feet and right arm to do the work, with the help of a specially made drum kit. The incident only held the band back a short while for three top 10 charting singles were released during this period with a #1 for Love Bites. The tragedy delayed the release of Hysteria, their next album, until 1987. The wait was worth it, however, because the album sold 15 million copies and produced two US #5 singles, Armageddon It and Pour Some Sugar On Me. A 14-month tour ensued ending in Seattle in 1988. But the problems didn't stop there, on 8 January, 1991 Clark was found dead in his London flat after binging on both drugs and alcohol; he had been in and out of rehab many times. It was later revealed that the band had been trying for years to stop Clark's self-destructive habits without success, even granting him a leave of absence to do so. Adreanalize (1992) was the next release, and an appearance at the Freddie Mercury tribute show in 1992 saw the introduction of Clark's replacement Vivian Campbell (ex-Dio/ex-Trinity/ex-Whitesnake) at a low-key Dublin gig. That album was followed up with Retro Active (1993) a "B"-sides and rarities release, as well as Vault (1995), a greatest hits collection. A new full studio album was released in 1996 in the form of Slang, a release that showcased their slick new radio friendly sound. Euphoria (1999) followed, with X (2002), the "best of..." compilation, Rock Of Ages (2005) and Yeah! (2006). On 28 April 2008, Def Leppard released Songs from the Sparkle Lounge. The album debuted at 5 on the Billboard 200 in the US. The first single, Nine Lives, featured country singer Tim McGraw, who co-wrote the song with Joe Elliott, Phil Collen, and Rick Savage. 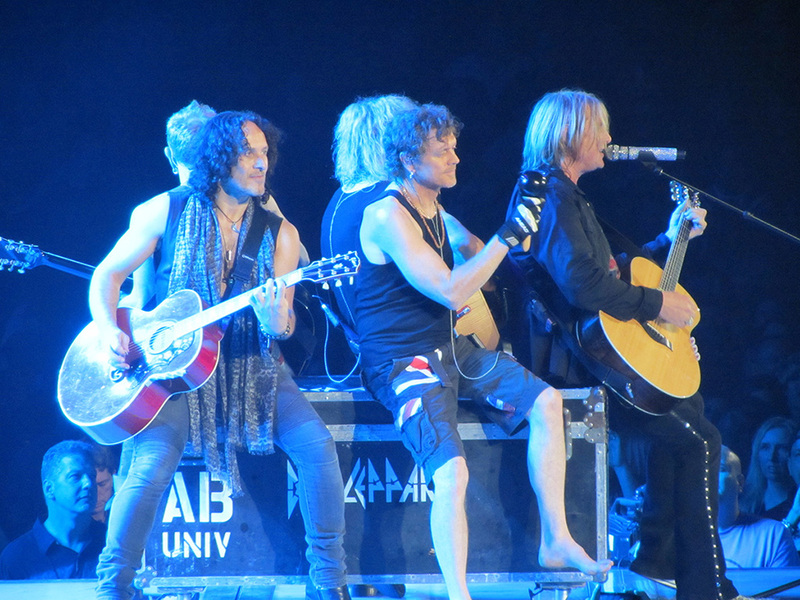 Def Leppard then toured 41 US cities as well as Toronto, Canada, during mid-2009 with Poison and Cheap Trick. They also performed at the Download Festival with Whitesnake and ZZ Top. In October 2008, Def Leppard played with country star Taylor Swift in a taped show in Nashville, Tennessee, called CMT Crossroads: Taylor Swift and Def Leppard, also released as a DVD in June 2009 at Wal-Mart. In October 2009 Def Leppard cancelled the last 23 shows of the 2009 North American tour for "unforeseen personal matters, as the reason. At the time, the band also deflected rumors about a breakup, saying, We're not splitting. Not at all. We often joke, what else would we do? You just can't imagine doing anything else". Their first live album was released in the summer of 2011 called Mirror Ball - Live & More, a two-disc opus with three new studio tracks. Their self-titled followed in 2015. They became known as a band that has managed to stay alive in the NWOBHM field with a more Pop sound than hard rock by combining the raw power of metal with a pop emphasis on melody, catchy hooks and vocal harmonies that, particularly later on, contrasted sharply with harsher contemporary metal and punk bands. Def Leppard playing an acoustic set at the Allstate Arena in Rosemont, IL on 7/19/12. Photo by: 'AngryApathy'.